Home Dell's Friends	Elegant Stencils and where to find them! Happy Monday, friends! Today I’m going to share with you a few projects my talented younger sister recently completed! She stenciled her powder room AND a feature wall in her master bedroom! Come see how they turned out! My younger sister, Stephanie and her husband are getting their house ready to put on the market this summer. Therefore, she has been in full-fledged purging, cleaning and staging mode for the last few months. Tackling one room at a time, Stephanie has cleaned closets, donated tons of stuff to Christian Ministries and has begun the huge task of repainting and staging each room in their home. I’m positive her efforts will be rewarded with a quick sale for top dollar! Stephanie tackled a few rooms already, freshening up each with new paint, decluttering and thoughtful furniture arrangement. She is trying to keep things neutral so the house will appeal to multiple buyers. At the same time, she is trying to update the house and decorate it a way that will set it apart from the competition. Buyers love a house that is move-in ready and one that has a a designer’s touch. So, Stephanie decided to add some stenciling to a few select rooms in order to up the wow factor. First she started in her small powder room. It was already painted a pretty coat of blue, so she decided to play off of the existing silver accents with a silver paint for her stencil. She found this stencil at Royal Designs online and ordered one for this room. The design is called, “tail feathers”. She began by stenciling a strip down the center of the wall behind the toilet. Isn’t it so pretty? Steph decided to also stencil the entire wall over the sink area. The silver paint looks perfect along with the silver mirror and sconce! I think a round mirror instantly updates any space. And here is the wall above the sink with the stencil and the mirror in place. So beautiful! And some pretty wall decor! The newly styled powder room looks fresh and up to date! I’m sure potential buyers will love it! Awesome job, Stephanie! In the master bedroom my sister started with a fresh, clean slate of Sherwin-Williams Accessible Beige paint. (SW 7036) If you haven’t used this color yet, I highly recommend it! It’s soft neutral and goes with almost everything! Steph decided to do a feature wall behind the headboard of their king-size bed. 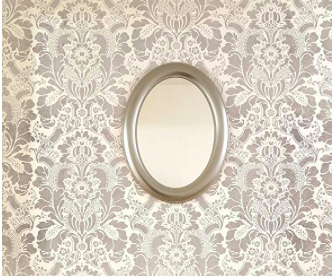 The stencil she chose is an elegant damask, called “Gabrielle” and is by Cutting Edge Stencils. This is stencil number one! The contrast between the two colors is perfect as they are only one color card apart. Steph said she watched several U-Tube videos on how to stencil, which helped her prepare for the project. From her research, it is suggested you start stenciling in the middle of the room and work your way out. And of course keeping the stencil level every time you move it, is key as well. From the looks of this wall, I’d say Stephanie mastered the technique! Beautiful and classic! The color of the stencil is Aesthetic White, also by Sherwin-Williams. (SW 7035) It offers just the right amount of contrast with the base coat. This wall looks like high-end wallpaper for a fraction of the cost! And, it’s subtle and neutral so it should appeal to potential buyers. And here is the final product, complete with artwork and pretty sconces. Gorgeous! This room took 3 days of prep work, painting, and stenciling to achieve this look. (And a lot of patience!) My sister is so pleased with her results, she said it will be hard to move! However, she and her husband will soon be empty nesters and want a little land and room to stretch their legs. I have a feeling after Steph gets finished with this house, there will be a bidding war! A huge thank you to my sweet and talented sister, Stephanie for sharing her projects and pictures with me so I can share them with you! Perhaps this will inspire you to give stenciling a try? Maybe me? Be sure to check out all of the amazing stencils by Royal Designs Studio via www.royaldesignsstudio.com or on Amazon. Great job, Steph! It all looks so gorgeous and great job on the blog, Dell!